For this Gaia message I have two similar meanings about situations being swept from Earth this year. I give them after the Gaia Portal post. They are followed with a meaning about positive innovations. and finally, one of how much truth is brought to light. I’m going to take this Gaia message as a whole, in a couple of ways. Aspersion can mean “a sprinkling of holy water”. So you can take it as being about abusive or in other ways crooked priests. They have multiple purposes beyond serving their people spiritually. Some of the possibilities are even more horrifying than simple abuse, but enough said about that. That only half-measures have been taken by the Vatican organization are already known by many; of course, not from the controlled mass media. The truth is made obvious to all people, and the perpetrators lawfully charged. Stored essences in this case would be the whole system of protection of corrupt priests. After the great efforts by many who worked to rid the people of bad priests, they are refreshed. People thought to be above-board, beyond accusation, are seen for who they really are. The People will, lawfully and in full measure, rid themselves of them. Stored energies used by leaders in this effort are refreshed. At this time, people have are developing new ideas, inventions, and new ways (Plenitudes of purpose) to replace the old systems that were designed for control and limitation. As usually happens, people starting new endeavors are told it won’t work, can’t be done. Some of it can actually be public slander. Or, especially by people who know you, you’re told it can’t be done by you. If you want to change your career, write a book or be any other kind of artist, start a newspaper or other business,…, any creative effort, you get naysayers—”Aspersive characters”. This is true of individual and group efforts. Now, those naysayers and slanderers are dismissed. Half-measures—ideas that don’t quite fulfill desired intent or serve only some people, while leaving out others in the area of scope, are illuminated and adjusted or replaced. Another meaning is that once some person or group begins an effort. that effort is recognized by someone, maybe even higher beings, who can and do provide exposure of the effort. Then any needed assistance will come forth. The illumination will also encourage those considering a creative effort, to begin it. Stored essence is energy needed to complete a task, that always kicks in when you follow your highest delight. Stored essence is also your Soul, or Higher Self. It is coming to the surface of your life, bringing to the fore “Plenitudes of purpose”—ideas and talents learned during the many lives of the Soul. As your Higher Self comes in, you will be following your highest passion. Those stored essences refresh us Creators. “Aspersive characters” can be false notions, people on the dark side (people of the lie), the Cabal who have controlled and lied to us for thousands of years. People who do not come to the Light will be dismissed from New Earth, one way or another. False notions and beliefs, and lies about who we are and our history on Earth will be dismissed. We are to be told the truth. Plenitudes of purpose are the reasons why Earth and we underwent this “war of good and evil”. This will come to Light, along with the reasons why our souls chose it. Half-measures: Partial progress of a Soul toward their goals here on Earth are recognized by higher beings, who illuminate further, the current incarnation. Stored essences: The “true” history of Earth and of each beings ever on her is written in the “Akash” / “Akashic Library” / “Akashic Records”. That knowledge will “come to the surface” for all of us. 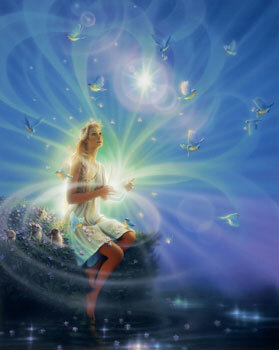 All on Earth are refreshed in body, emotions, mind and Soul with this Illumination. Thanks, Hugo. Have an exciting trip!